It is both adventurous, thrilling and romantic, but certainly not as relaxing as a beach holiday. Die hards can even go for the July the 1st Glacier, almost one days travels away up onto the Qilian Shan, the Snowcapped Mountain overlooking this magnificent pass. My Hat off to those old Chinese who really held on through all of it. Persistent types those guys ..
Kind of got me a bit of an idea of how it must have felt in the old days. 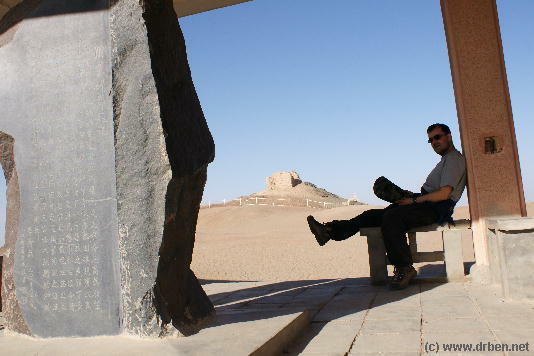 There is a Poem about the gate in which they drink wine, and bid farewell and off to an uncertain future ..
You don't want to get lost out-there in the Taklamakan Desert, which is why even in the old days around say 800 AD, there was a fire beacon here to guide the way. 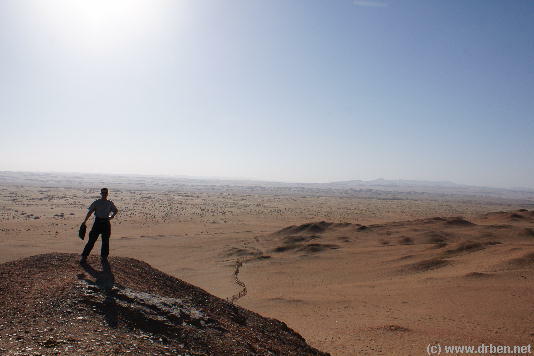 The Ancient Silk Road continues westward into nothing. In the far past this was the land of barbarians, robbers, wild beast and other untold dangers... Even today it doesn't look very inviting, does it ? 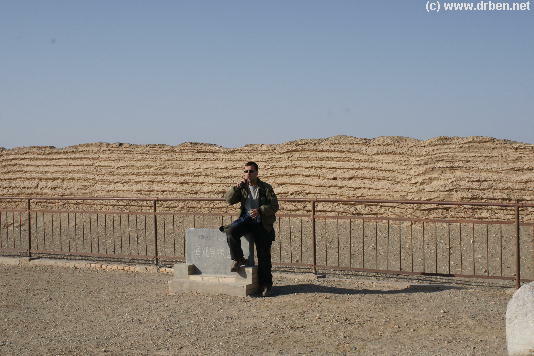 On to JiaYuGuan then, the site of the Last Fortress reinforcing the Great Wall and the site of JiaYuGuan Pass underneath the Qilian Shan of more than 4500 meters. 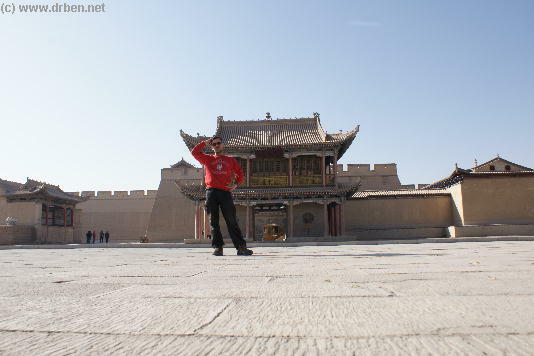 I was determined not to have the Mogao disappointment again, therefor I took quite some time to use the self-timer. 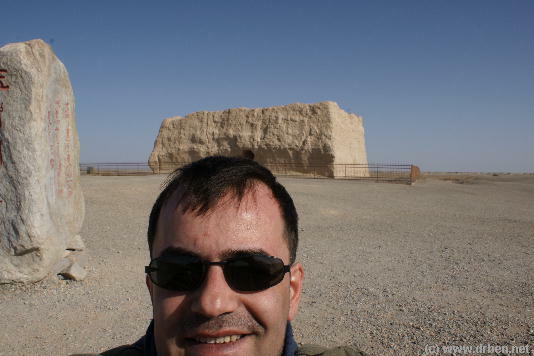 Dr.Ben inside of JiaYuGuan Fortress, JiaYuGuan, Gansu Province. 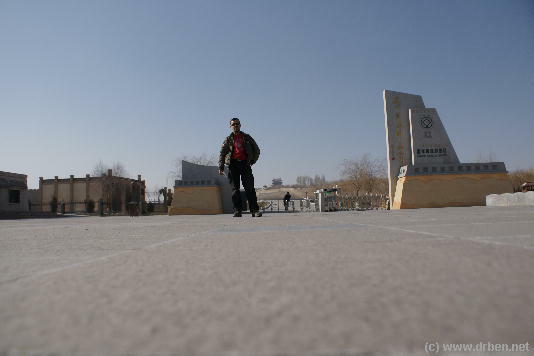 The JiaYuGuan Fortress can be seen in many chinese movies with an historical or silk road battle theme. 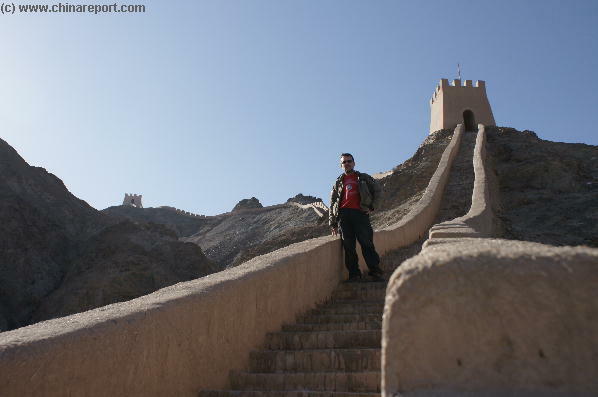 As remote as it is, it stands at a beautiful barren place which is a thrill to visit if you are a great wall or China History Fan. 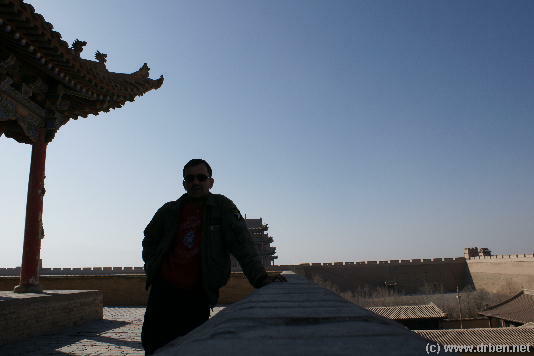 Yang Guan Pass - South Gate Beacon of the Great Wall and the Silk Road, November 2007. If you make it out as far West as this fire beacon you just need to have some photos made. Almost as remote as the Jade Gate, YuMen offers a spectacular outlook over the Taklamakan. Scroll down or have a look at the various maps and get a pretty acurate idea ! 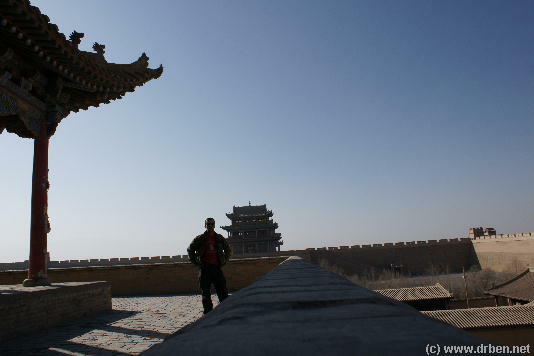 The Other Pass and Beacon in the West is the Sun Gate or Yang Guan Pass, also known as The Gate of the Sun. 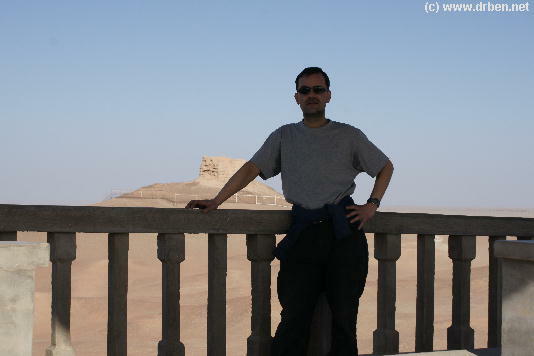 From Here the Southern Route of the Silk Road started its unprotected stretch further westward. 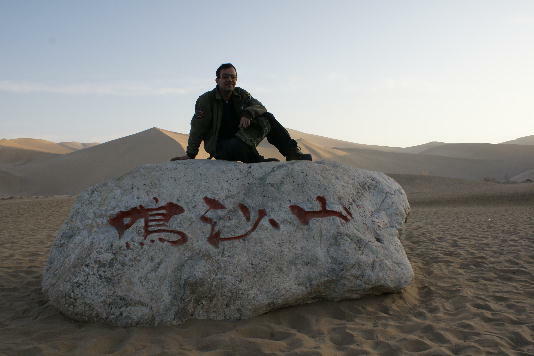 Yang Guan Beacon, Dunhuang in Gansu, November 2007. 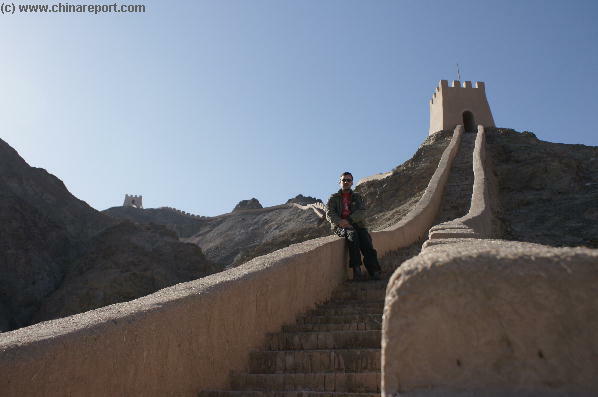 A Visit to the Tang Dynasty Great Wall far outside Dunhuang and passed the Jade Gate is likely to make you quite thirsty. So Cheers !!! 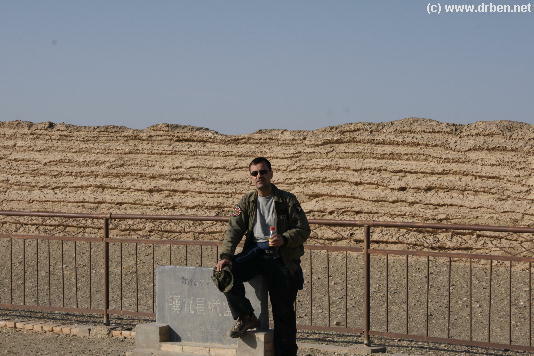 A Toast with DrBen reaching the End of the Great Wall of China in the Tang Dynasty, November 2007. 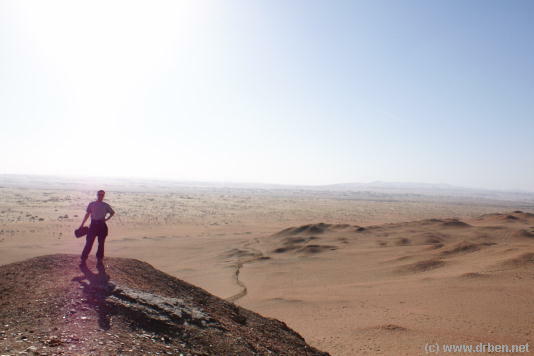 The Silk Road definitly has it when it comes to adventure and dramatic lanscapes ! 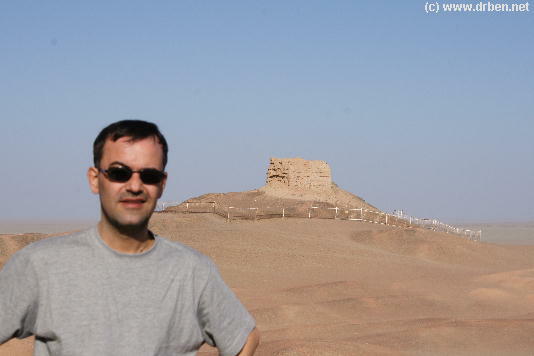 Dr.Ben at Crescent Shaped Pool and at The Sighing Sands of Dunhuang, November 2007. Still toying with attempts at self-portraits ........ and enjoying myself ! - The China Reporter !! 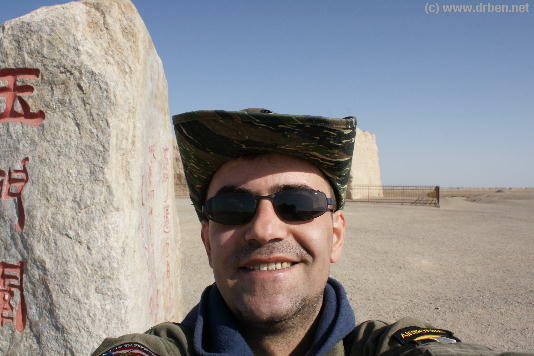 Dr Ben at the YongdingMen in November 2007 on a tour of the southern Chongwen District and the former Imperial Altars. In the Past the large YongdingMen Gate was demolished to make way for the below highway intersections but in 2004 it was restored, albeit in a much smaller format than the original gate.
! 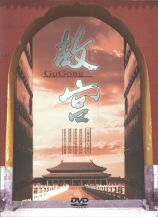 Sign the The China Reporter Guestbook ! 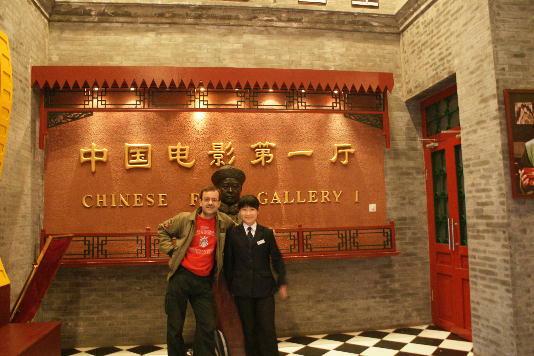 Less well planned was the visit to the Chinese Film Gallery and memorial to the Fengtai Studios of Beijing, which is the studio that produced the first Chinese Film and then some. As you can tell I was warmly welcomed by the Staff, who are quite unaccustomed to visits from the International Press. 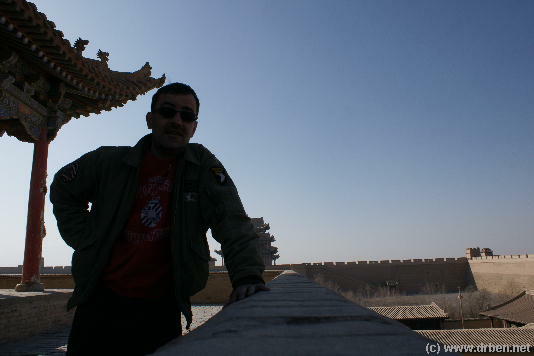 I can assure you however, this is a unique place in Chinese History and the history of Culture in Beijing. Find the Film "Shadow Magic" if you are curious to find out what I mean exactly ! The Palace of Peaceful Old Age, you may be surpised, was never before visited by Dr. Ben. 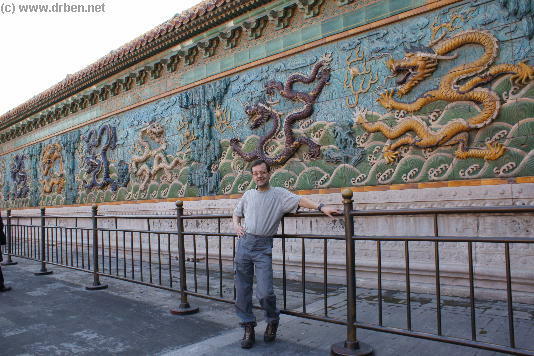 It is defintly one of the jewels of the Palace Museum and the 9 Dragon Screen is always good for a holiday remembrance shot ! thus, but only with central cave pavilion !! The Last Beacon on the Great Wall of China at YuMen Guan is a spectacular place and one of the places I had wanted to visit in order to add something new and rather unique to our information on the Great Wall of China. 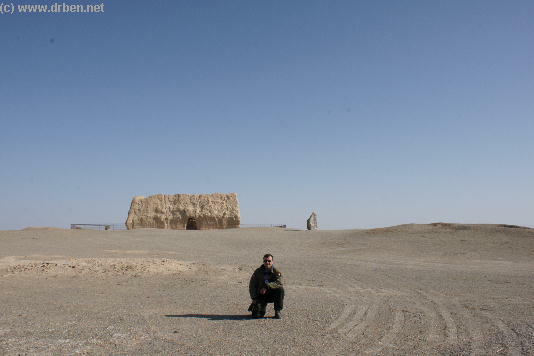 way North-West of Dun-huang is one of the remotest places in China. 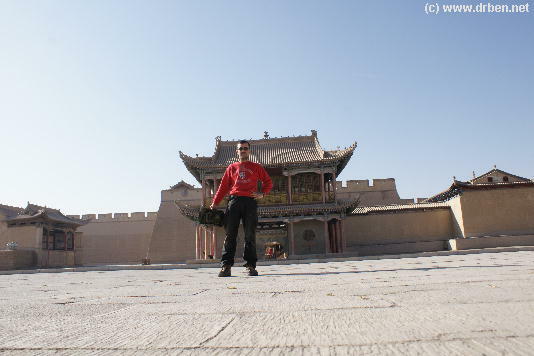 Another succesful photo mission (that is whithout finding the place clogged with groups of wandering tourists) was made to the Palace of Peaceful Old Age, the large Retirement Palace of the Qianlong Emperor of the Ching Dynasty, a still undocumented section of the Palace Museum. 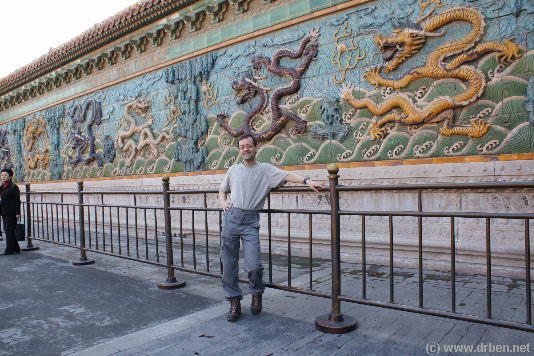 Here you see Dr.Ben at the famed Nine Dragon Screen, the only such Screen inside the Imperial Palace (the other two are located at BeiHai Park, Beijing and in Datong, Shanxi Province). 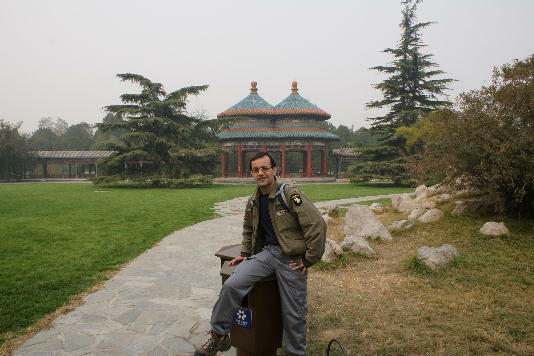 A Return to everpleasant and beautiful Temple of Heaven (Tiantan) Park in Beijing. On a Tour of South Chongwen District I just had to detour through the Park and have myself photographed with the double-eaved pavilion, a unique piece of architecture in China. More Photos on the China Report ! Unfortunatly, as I was working with yet a new camera it turned out, at first I could not make the self timer function work. 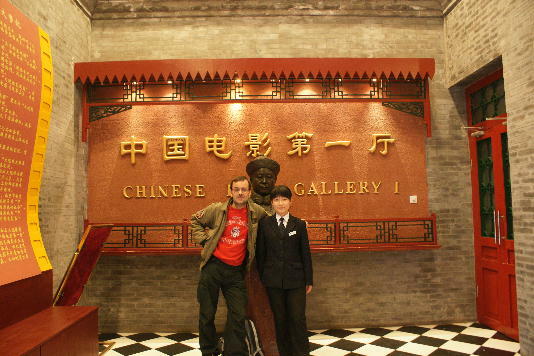 Therefor, I had to ask some Chinese Passersby to take my photo, with not always a perfect result. 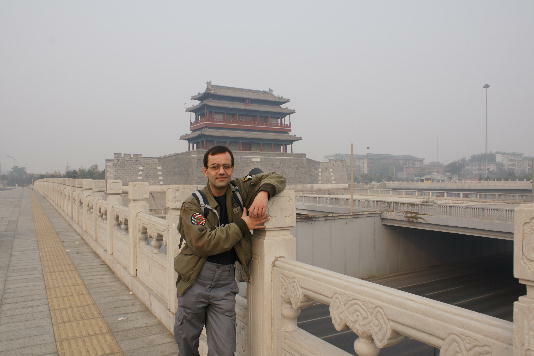 -> Dr.Ben at Ditan Park or the Altar of the Earth, North of the Lama Temple in Beijing. 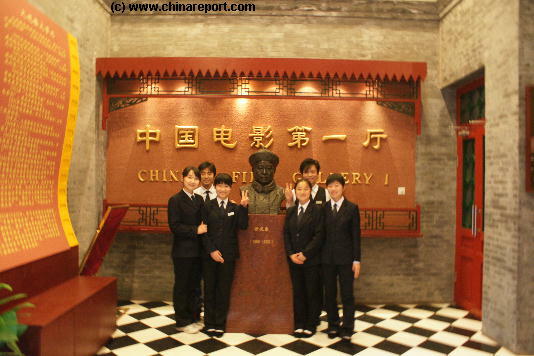 The Staff of the Chinese Film Gallery at East Dashilan Street posing for the Official Report and Friendship. Geez, I knew i should have dressed up, but I only got the idea when i got to Dashilan Street and remembered it was still on my wishlist ! 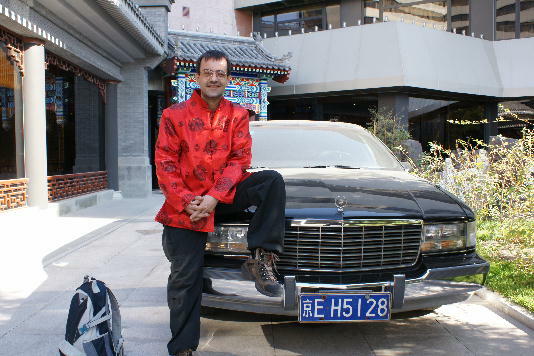 back, so I first went for a bit of shopping and relaxing, getting myself some silks at nearby Dashilan and Posing at the Capital Hotel, my regular Beijing Base. The Next Challenges on this Journey through China would come in shapes and sizes not encountered before ! 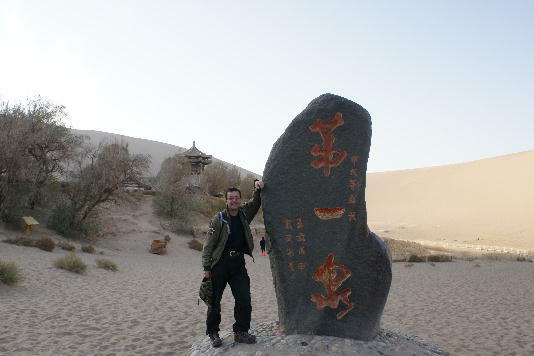 Dr.Ben at the Sand Dunes surrounding Crescent Shaped Pond, just South of and outside of the oasis Dunhuang in Gansu, Western China. 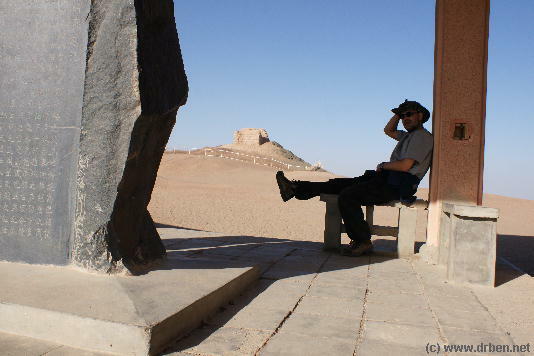 Dr. Ben is used to large sizes of the Monuments he visits and photographs, but this ... is something else ! 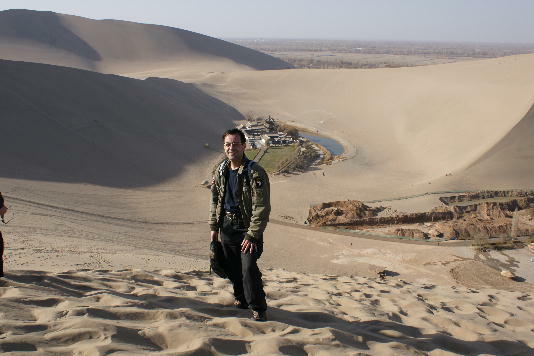 It was a fantastic day in which I hiked around Dunhuang Village, walked along the road between farms and desert to find these Humonguous Sand Dunes and then more. 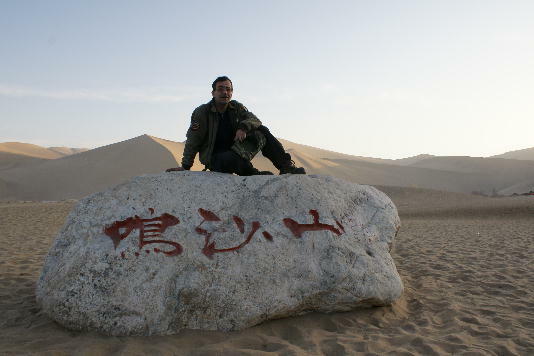 The Sighing Sands of Dunhuang, November 2007. 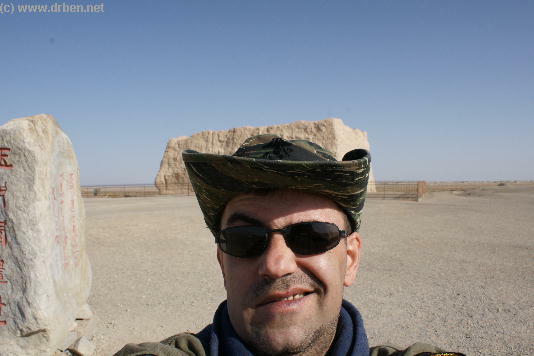 Somewhere in the Taklamakan Desert. This photo was made by an old peasant who actually lives almost adjacent this place at the riverbed with his donkey. once was the first toll house on the Tang Dynasty Great Wall of China. Dr.Ben at YuMen Pass November 2007. If you were wondering what I was doing there and where it is located. 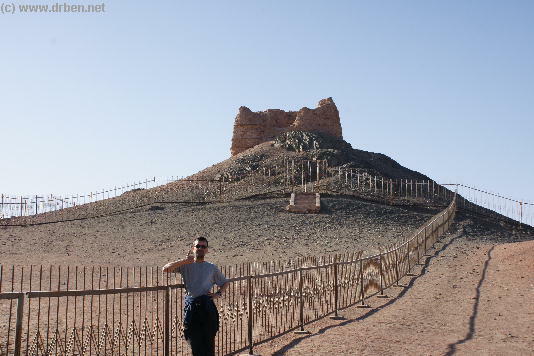 The End of the Tang Dynasty Great Wall of China lies far out into the Taklamakan Desert, north-west of Dunhuang. Even in November it is rather a hot place ! But very worthwhile. 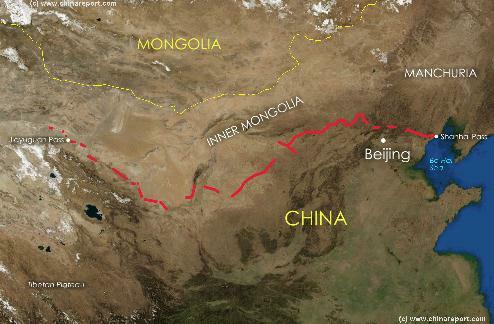 Not only is this the oldest remaining section of the legendary Great Wall, it is the farthest place in the ancient Chinese Empire. In fact - it lies so remote there is no one out-there to get in the way. Great ! 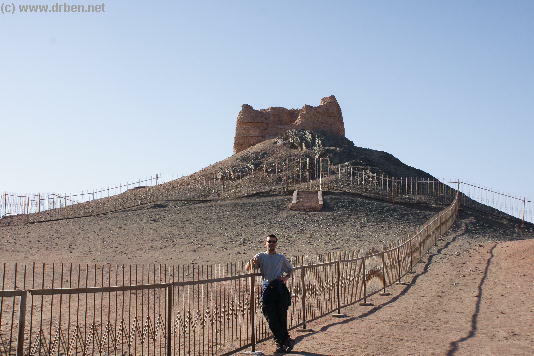 Latest Addition- Location of Dunhuang and the End of the Tang Dynasty Great Wall in the West at Jade Gate. 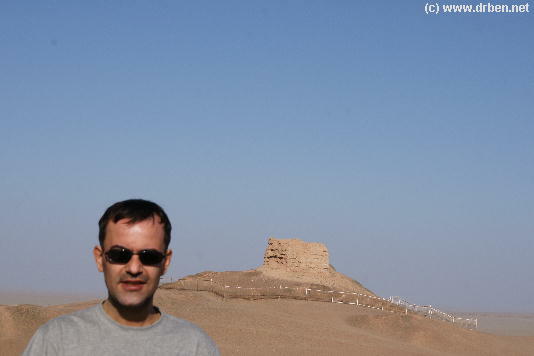 West of this Beacon was the uncivilized world and the dangers of the perilous journey on the Silk Route. A last Photo of Dr.Ben posing with school class on the White Pagoda Hill of Lanzhou, Capital of Gansu Province in West China. They sure are friendly in Lanzhou ! A Tour of the great river from Source to Sea ! Only available from our Online Store ! - Buy Now !! are depicted as separate area's. 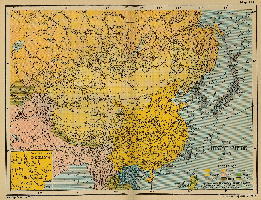 Although made to depict a situation a 1000 years after the Tang Dynasty, the map accurately shows the hexi corridor and the "end of China" in the West, which was just passed Dunhuang during the Tang Dynasty. After all this self=photo nonsense I got on with my plans and proceeded to the official end of the Great Wall of China, which turns out to be not that far from the toll house. 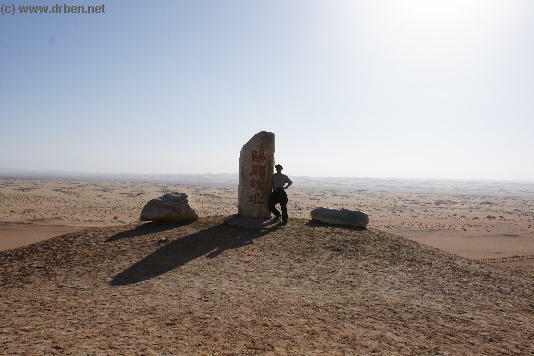 Some two kilometers further is the official Han & Tang Dynasty Wall Memorial, however... I walked a lot further to find the wall continues for miles further into the empty desert, aside an river bed that is parched dry in November. 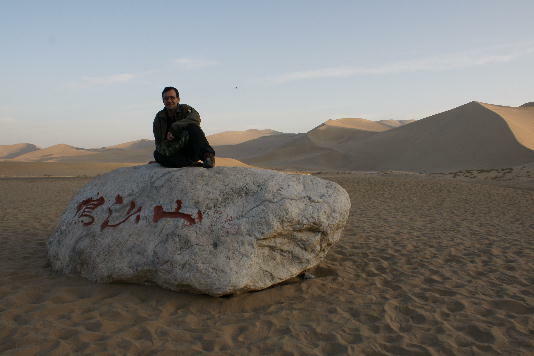 Beyond Dunhuang Oasis lies the empty desert and some last signs of old civilization. Apart from the toll house there is a relic many people would be interested in. 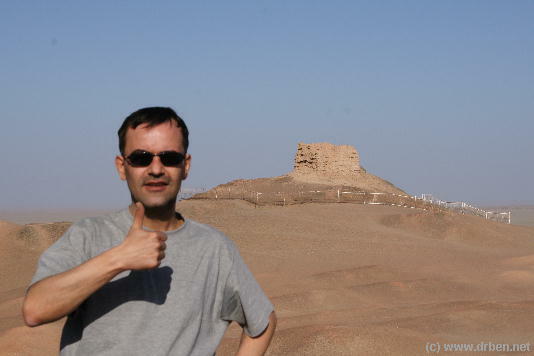 Maybe you have to visit the place to understand how daunting this silk road trading business must have been. Really, even today un-prepared expeditions around here may get you killed. 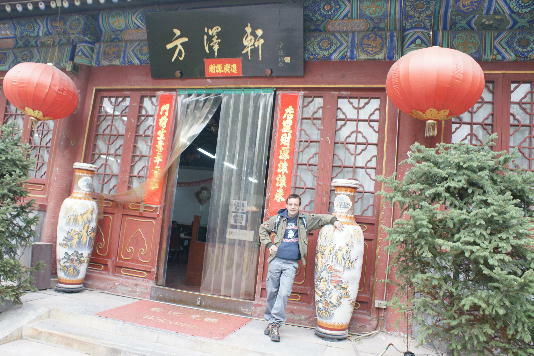 I did not have any wine at the Yang Guan Pass. Only Grape Juice and a taste of the grapes from YangGuan Village, which I can assure you - were the largest and so far sweatest I ever tasted ! the beacon. That is the Point ! Sponsor DrBen and Travel in Luxury, staying at the best locations and seeing all the main sights. Book Online with Kuoni (from UK). 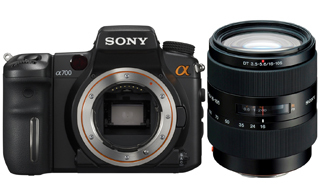 Our Latest Business Partner and Travel Option ! Fly yourself by Luxury Private Jet to China and never bother with the cues ! That's Comfort. As a I had not been touring China for about a year, reaching this point really gave me an extra boost !!! Also, it seems to me that with these kinds of photos and subjects no viewer / visitor can complain that the China report does not go the extra length to make its reports extra-ordinary and interesting places one would usually not hear that much of. We are thumbs up for anything worth-while. A Crumbling and Deserted YangGuan Beacon baking in the sunlight. Which is one of the reasons why Kuoni and Marriott admitted us to their partnership programs. Use the Link and help cover our costs ? In return the best practical and tried advice that we can provide ! 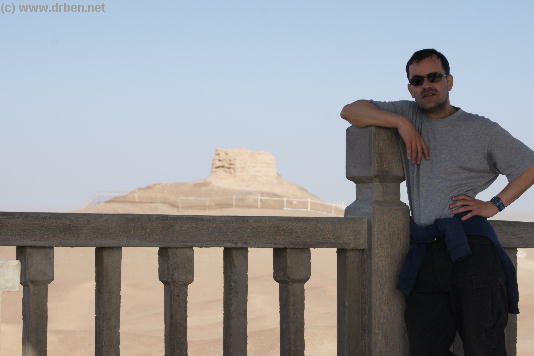 During the Han Dynasty that founded the Silk Road here, most of this area was uncharted and no constructions were in sight for 100s of miles ... Like visiting the moon. Let's get out of He-ere ! 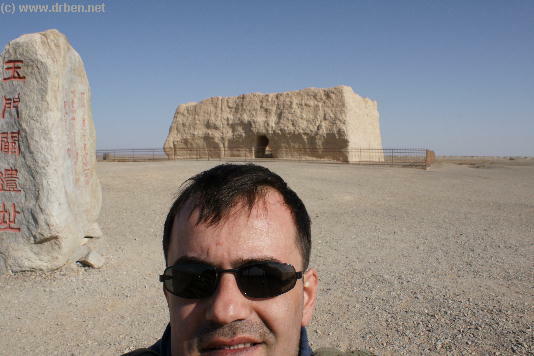 Dr.Ben Outside of JiaYuGuan Gate. Sponsor DrBen and China Report. 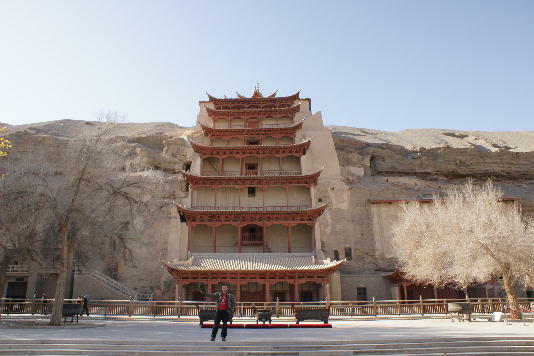 Click the Link + Book directly at Kuoni and Travel in Luxury to the JiaYuGuan Fortress. Hotel next door ! A Schematic Map depicting other details along the Full Length and main pathways of the Ancient Silk Road during the Han Dynasty Period (206 BC - 221 AD). 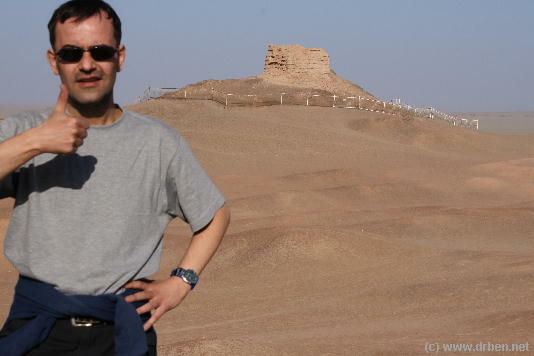 As seen from China the Silk Road extends due Westward from Chang'An (Xian) the Han & (later) Tang Dynasty Capital. 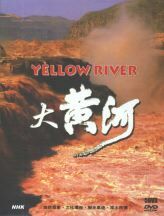 The Yellow River is crossed at Lanzhou, after which Dunhuang is the Last Station. 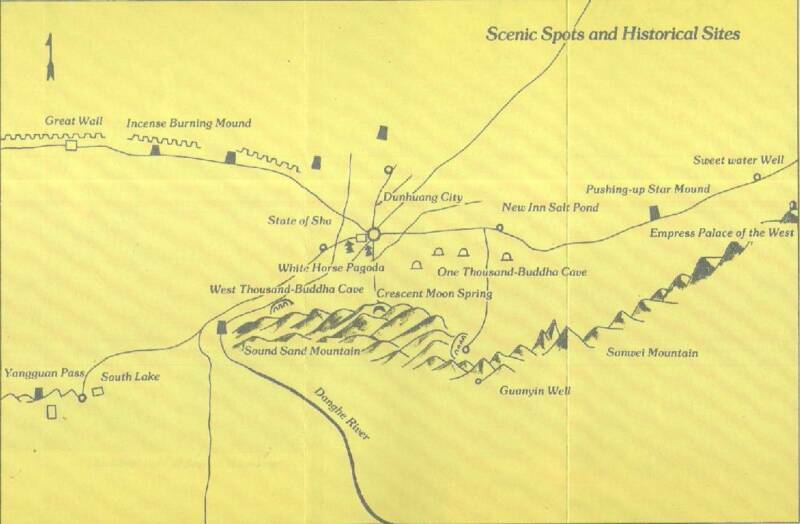 This Map depicts the Lost Civilizations of Loulan and Hotan, as well as the south route and north route of the Silk Road coming together at Dunhuang in current day Gansu Province of China. 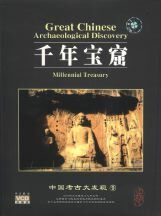 NOVA's grand documentary - Find out new anthropological facts on the history of China, the Silk Road and the great migrations of early mankind. Buy the Documentary now - Click Here ! Music Bonus - "Parting at Yang Guan" (Instrumental) - Classical Chinese Folk. 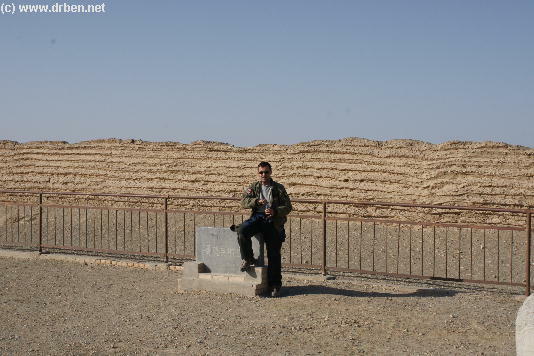 Wall of China, or Shi Guan Pass, some 7 to 8 kilometers North out of JiaYuGuan City. The Wall at this location is only short but quite spectacular. That is, it is quite a steep climb at quite an altitude. But as far as I am concerned it certainly was worth the Climb. During the entire day I was the only visitor, so I could enjoy all of it by myself. By Times this resulted in quite the eerie athmosphere. Made me wonder, what would it have been like outthere in the Old Times? Filled with silk road traffic, or .... more like guarding a nothing pass on the edge of almost nowhere ?